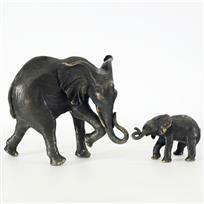 "Mother and Child" is a limited edition bronze two piece sculpture set, numbered and signed by Donna Mason-Adams. Includes Certificate of Authenticity. Large elephant measures approx. 13" (width) x 5" (depth) x 11" (height), 16 lbs. (weight). Small elephant measures approx. 9" (width) x 3" (depth) x 5" (height), 3 lbs. There may be some small areas with a slight white coloring due to oxidation, which commonly occurs with bronze pieces. This is normal and superficial. The inner layers of the object are protected from deterioration. Donna Mason-Adams, "Mother and Child" Limited Edition Bronze Two Piece Sculpture Set, Signed and Numbered with Certificate of Authenticity.